Camille Poirer was born outside of Montreal, Quebec, Canada, on March 3, 1837 (some say 1838). After his mother died he went to live with an uncle near Montreal. He worked on his uncle’s farm until he was fourteen, then left to apprentice as a shoemaker. At 18 he emigrated to the U.S., arriving first in Manchester, Massachusetts. As he could speak no English, he was forced to earn his living laying bricks and chopping wood. During this time he severely injured his leg with an axe. Dejected, he returned to Canada. There he married and started a family, but his wife died in 1864. The next year Poirer and his children moved to St. Paul to manage a shoe factory. He remarried in 1868 and decided to try his luck in Duluth. He walked to Hinkley on his maimed leg and took a stage the rest of the way—the trip took him four days “of very cold and suffering.” In Duluth he established a boot and shoe company on Superior Street just west of Lake Avenue. 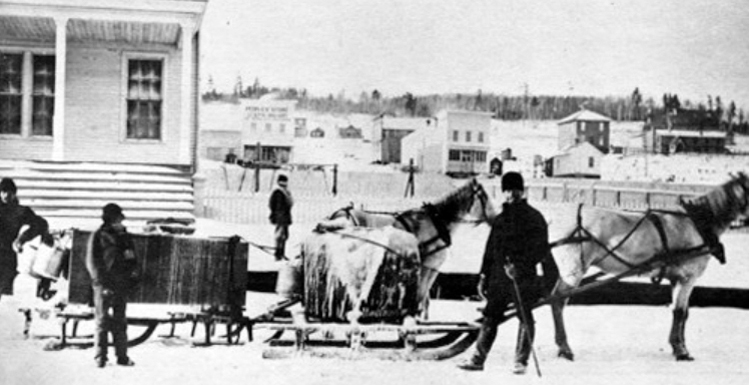 He also dabbled in logging and real estate and acted as Duluth’s early water works: he would fill a hogs head with Lake Superior water and deliver it by horse-and-wagon to subscribing businesses and residences before Duluth had any sort of municipal water service. He eventually focused on canvas goods, creating Duluth Tent and Awning business. It was in this capacity that he invented the Poirier Pack Sacks and “several other valuable devices for the use of travelers, campers and others who were, like himself, devotees of sports afield and afloat.” These were early version of the “Duluth Packs.” (Duluth Pack, a descendant of Poirer’s Duluth Tent & Awning, still operates at 1610 West Superior Street. )Poirer also served on the board County Commissioners of St. Louis County; a staunch Catholic, Poirer was president of Duluth’s St. John the Baptist Society. Always kindly, scrupulously honest in his dealings and thought, never unjust, never unfair, with a heart that denied itself to no one and to no right cause, Camille Poirer has closed a life lived in an Arcadia of his own making. To know him was to respect and admire him and almost to envy the serene peacefulness that rose above physical ailment or outward misfortune. He was, too, a man of force of character, of decided opinions and independence, and, like so many of his blood, he had a passionate love of the out-of-doors, of the house of nature, and all the people who live in it. He was one of Duluth’s genuine pioneers. He had lived here for forty-nine years. In the earlier days he had much to do in public affairs and always on the side of what was right and fair and progressive. He was the inventor of a number of conveniences, and here his love of the woods showed, as they were all for the woodman, the traveler, and the camper. As a business man, as a friend, as a citizen, as one who always helped, he has left everything he touched and everyone he met the better and happier. Such a man can hardly be said to have died.